Welcome back to Messier Monday! We continue our tribute to our dear friend, Tammy Plotner, by looking at the open star cluster of Messier 52. Enjoy! In the 18th century, while searching the night sky for comets, French astronomer Charles Messier kept noting the presence of fixed, diffuse objects in the night sky. In time, he would come to compile a list of approximately 100 of these objects, with the purpose of making sure that astronomers did not mistake them for comets. However, this list – known as the Messier Catalog – would go on to serve a more important function. One of these objects is Messier 52, an open star cluster that can seen in proximity to the northern constellation Cassiopeia. Located about 5000 light years from Earth, this star cluster is easily spotted in the night sky because of its association with Cassiopeia’s familiar W-shape. It can viewed with binocular and telescopes, and will appears as a hazy, nebulous patch of light. May it glitter and spangle for you! In the rich star cluster fields of Cassiopeia, M52 is distinctive for its size and brightness. It’s not hard to find! Begin by identifying the W-shape of Cassiopeia and focus on its two brightest stars – Alpha and Beta. Because this constellation is circumpolar, remembering to look at the side that has the brightest stars or the steepest angle, will help you remember how to find this great open cluster. Now, just draw a mental line between Alpha, the lower star, and Beta, the upper. Extend that line into space about the same distance and aim your binoculars or finderscope there. In binoculars M52 will show clearly as a beginning to resolve star cloud and a hazy patch in a telescope finderscope. Even the smallest of telescopes can expect resolution from this multi-magnitude beauty and the more aperture you apply, the more stars you will see. M52 is well suited to urban or light polluted skies and stands up well to fairly moonlit conditions and hazy skies. How Big Is The Big Dipper? The Big Dipper is big. Come on, it’s right there in the name. But how big is the Big Dipper if you could see it from all angles? Ask someone to name a constellation and they’ll usually say the Big Dipper. Anyone living in the Northern hemisphere who can draw a spoon generally can recognize it in the sky. I am about to shake the foundations of your reality with a level of pedantry that at bare minimum should earn me a solid shaking and possibly even a face punch or two. The Big Dipper is not, and never will be a constellation. It’s an asterism, a familiar pattern of stars in the sky. There are 88 constellations, and the Big Dipper isn’t one of them. It’s a part of the constellation of Ursa Major. In fact, the handle of your familiar spoon is actually the tail of the great bear. And now that you’ve made it this far, I shall reward you with what you’re seeking. Just how big is that Big Dipper? There are a couple of ways to skin this bear’s tail. We can say its size relative to the amount of sky real estate it occupies, or we can do the end to end Kessel run. You might be surprised to know how much of the sky it takes up. Astronomers measure the sky in degrees. 360 degrees takes you all the way around the sky, and our Moon measures half a degree across. Dubhe and Merak are the pointer stars in the Big Dipper. You could put 11 full Moons side to side in the gap between them. And about 40 full Moons from bottom corner of the Dipper to the end of its handle. So, the Big Dipper measures about 20 degrees. Here are some easy ways to measure sizes. Your pinkie nail, held at arm’s length is half a degree. 3 fingers is 5 degrees, your fist is 10 degrees. Rocking out with devil horns are 15 degrees and hang loose or the inspector gadget phone is 25 degrees. Trekkers and Trekkies may prefer to use the Vulcan live long and prosper measurement, which is about the same number of degrees you are from getting a romantic companion. So, stem to stern, how big is our giant celestial ladle? I know you know those things aren’t in anything resembling a straight line. Some of the stars are closer, and some of the stars are further out. If you could make a box that completely surrounded them, how big would it be? The closest star in the asterism is Megrez at 58 light years. and the most distant is Dubhe at 124 light-years. And yet, they all look roughly the same brightness. This means that Dubhe is a much brighter star than Megrez, and it’s just further away. Because these stars are moving in the sky what we see as a Big Dipper today didn’t always look this way. 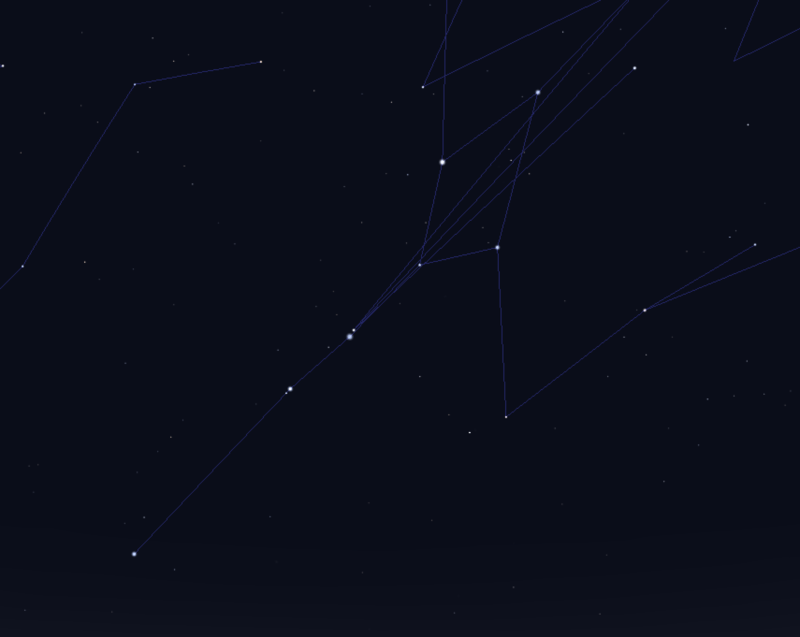 150,000 years ago, the Big Dipper looked like this (above). And in 150,000 years from now it’ll look like this (left). Less dipper, more plow-like. Or maybe a shoe form? Shoes are kind of like ladles, right? Super gross, terribly unhygenic ladles. Our brains keep from exploding by being pattern making machines. We see collections of stars in the sky and turn them into shapes. But it’s all just a matter of perspective. You’ve got to be right here and now to see the sky we do. Unless you’re looking for a giant “W” in which case you’ll always find one of those. It may not be the constellation Cassiopeia, but it’ll still be a pattern in the stars. What’s your favorite asterism? Tell us in the comments below. On the morning of September 21, 2011, the International Space Station made a beautiful pass over San Antonio, Texas through the constellation of Cassiopeia. The pass was caught by Adrian New using his Nikon D200 camera and 18-70mm lens. The camera was set at ISO 200 and 30 second exposure.